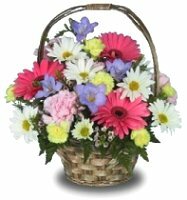 McGlathery’s Florist & Greenhouses has been a leading florist in the Powell area for many years. Our professional and caring designers have over 40 years of experience and can create the perfect arrangement for you. Whether you prefer an arrangement totally unique or wonderfully traditional, we design with you in mind. McGlathery’s Florist & Greenhouse is more than just your average flower shop! If you are looking to find the perfect gift, try one of our fruit, gourmet, or snack baskets. We also have a variety of plush, candles, and dried and silk flowers. So whether you are looking for one of our remarkable fresh arrangements, striking green plants, or something from our fabulous gift line, look to McGlathery’s Florist & Greenhouses. We offer daily deliveries to all local funeral homes and hospitals. We are open daily Monday through Friday 9:00 to 5:30 and Saturday 9:00 to 4:00. All major credit cards accepted.